But fortunately, advertising platforms nowadays offer retargeting as a way of reconnecting with those people who might otherwise never come back to your e-store again. 70% of people abandon their shopping cart. People visit two to four sites before purchasing. It finds anonymous past visitors and interacts with them again. It offers an opportunity to re-engage with high-value users who are halfway there to complete an action on your website. Retargeting is a type of advertising that allows customization of ads based on users data. To put it more simply, you can serve tailored ads to your website visitors based on what pages they visited. Retargeting is great to increase brand awareness and conversions. Awareness – the more a user sees your brand online, the more he will become familiar with it. Conversions – retargeting means that you can show specific products to people who have visited specific category or product pages. This increases the chances for your product to be bought. Remarketing is another term for retargeting. The only difference is that remarketing has been introduced and used by Google Ads. The first “cookie” was invented in 1994 by Louis J. Montulli II, an engineer at Netscape Communications Corporation to check whether the visitors of the Netscape website already visited the site. It wasn’t until 1995 that cookies were introduced for public use when Internet Explorer 2 integrated the technology. One year later, The Financial Times published an article “exposing” the scandalous code that stole user information. In 1998, DoubleClick released Boomerang, which is actually the first officially recognized version of retargeting. In 2010, Google AdWords launched Remarketing. People could now install a piece of code on their web pages and collect data about their visitors. In 2012 they upgraded the tag code and made it functional for all website pages which provided more specific user data and targeting. In 2013 Remarketing was made available for YouTube. 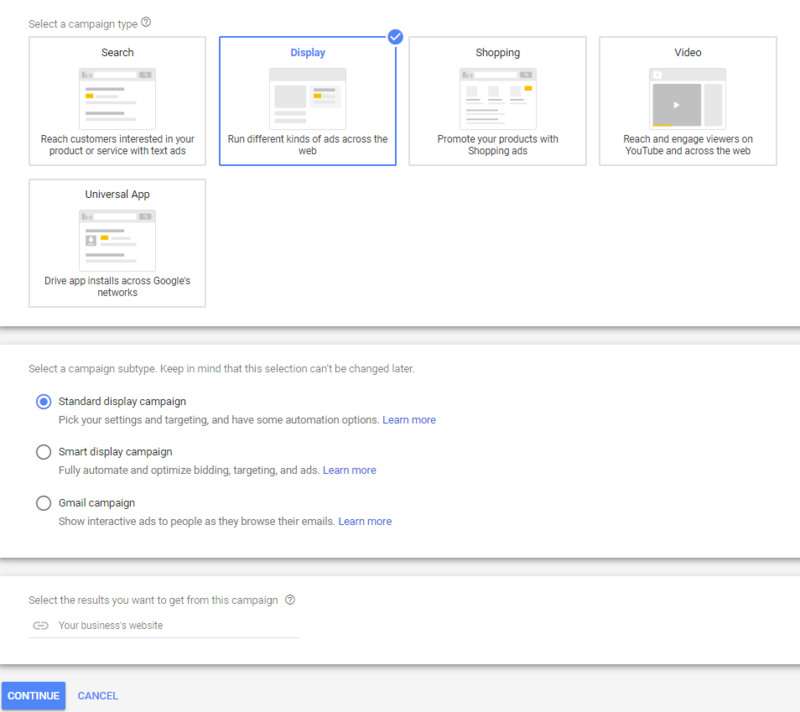 Also, Google AdWords (at that time) released dynamic remarketing and search remarketing. That same year, Facebook reached 845 million users and decided to build their own retargeting platform, FBX retargeting. 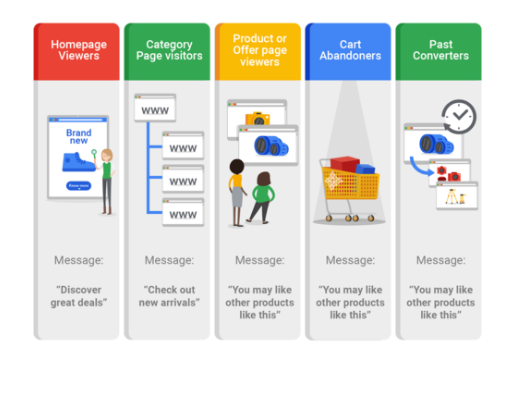 In 2015, Google launched an even sharper tool for retargeting, connecting Analytics with AdWords: the Remarketing Lists for Search Ads for Google Analytics. This service worked by matching keywords from pages browsed and Google searches. Site retargeting is the process of showing ads to people who have visited your site, but left without converting. This is the broadest definition of retargeting because it doesn’t take into consideration the inventory where the ads are displayed. It simply refers to the process of using data to bring your visitor back to reduce shopping cart abandonment, increase conversions and drive brand awareness. Even if email alone is a very strong driver of sales ($44 ROI for every dollar invested) and a very popular channel among marketers (according to a Forbes study, 67% of marketers say that it is key for attracting and engaging prospects), there is plenty of room for improvement. Enter: email retargeting. Email retargeting allows you to show ads to users or subscribers who have opened your emails. It worked like traditional site retargeting. When a user opens the email, a cookie is stored in his browser. Using that cookie, the user is identified when he browses other websites or social networks and sees your ad. However, email retargeting stopped being a viable solution once Google changed the way it displays images. Because Google caches images, the retargeting pixel can’t be dropped into the users’ browser. Without that, you can’t build lists of users to show ads to. The alternative all previous email retargeting providers adopted is CRM retargeting. With CRM retargeting, you can show ads to users based on their email address. All you need to do is upload the email address list to your retargeting provider. They do the hard work of matching the data you provide with data from other online/offline CRM to identify the user and show him your ads. Automatically, of course. This type of retargeting is similar to Facebook custom audiences. With custom audiences, you need to upload a list of emails, phone numbers or users ids. Facebook does the matching, identifies the users and shows them your ads. With CRM retargeting, the success rate depends on the match settings you select when you upload your data. Also, if you want to run this type of retargeting, you need to choose a company that provides this service such as Ad Roll or Perfect Audience. Social media retargeting refers to displaying ads on social networks. What’s different between site retargeting and social media retargeting? Like we mentioned earlier, site retargeting only mentions the process, it doesn’t say anything about the channel. Before the Facebook Exchange, the default channel for retargeting ads were banner ads displayed on websites. With social media retargeting, you’re specific about where you’re having your ads shown. The Social Media platforms that offer retargeting are: Facebook, Twitter, LinkedIn, YouTube and Quora. While the other types of retargeting are available from multiple companies, remarketing lists for search ads are available only in Google Ads. You can use your current remarketing lists and reach site visitors when they go back to Google to make a search. Instead of showing banner ads, you show your users classic search text ads. Because there’s been less talk about it, remarketing lists for search ads is not as popular as other types of remarketing. Like with social, still, it’s good to know the term and what it actually refers to. Remarketing lists for search ads sometimes gets confused with search retargeting because they both use “search” and “retargeting”. However, they couldn’t be more different. Remarketing lists for search ads allows you to show search engine text ads to users who have been to your site. Search retargeting allows you to show banners and Facebook ads to people who have never visited your site, but have searched for relevant keywords and phrases. Even if it contains the word “retargeting”, search retargeting is very different from the other types mentioned before. While all the others are ways of getting users that you somehow have come in contact with (either they visited or subscribed to your website), search retargeting allows you to reach highly potential, entirely new customers for your business. Search retargeting allows you to show your ads to users who have previously searched for keywords that are related to your business, but have never visited your website. For instance, if you have an online shoe store, your ad could appear to users who have searched for “high-heeled shoes” or “Red shoes”. Search retargeting is a great way to reach users beyond their initial search. Because it targets recent interest, it’s also highly effective. 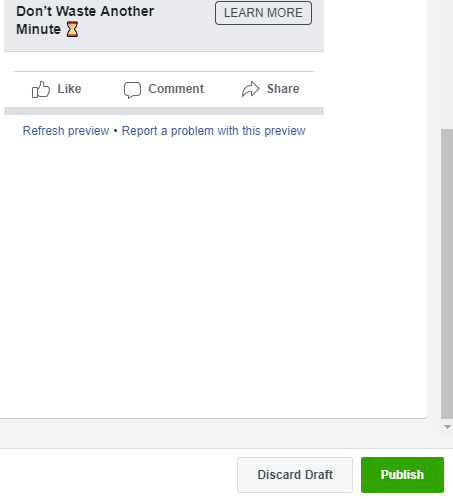 Ads can be displayed both on Facebook and the web. 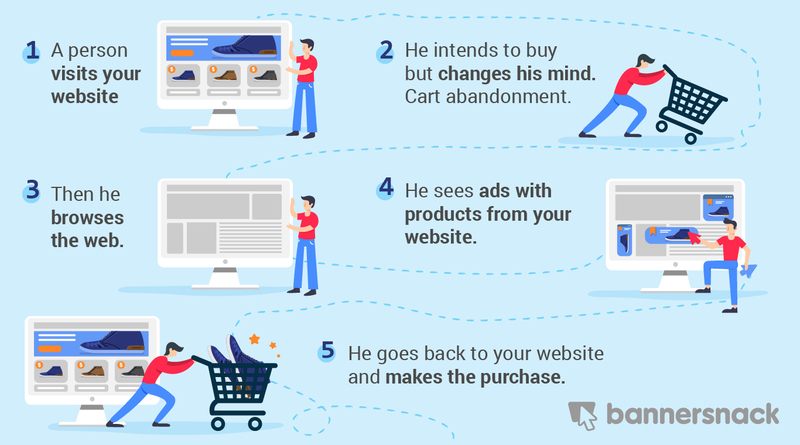 When the person leaves the website, remarketing starts to work, by showing customized ads, based on his actions. These ads can be shown either on websites, in apps, or in Social Media platforms such as Facebook, Twitter, LinkedIn and so on. Let’s see how you can build a retargeting campaign, step by step. To run retargeting advertising campaigns, you need to add retargeting code to each page of your website. If you’re not familiar with your website’s code, hire a developer or let someone with a technical background do the job. adds website visitors to standard remarketing lists in your advertising platform’s account (Google Ads, Facebook etc). A remarketing list is a collection of website and app visitors or users. When you create a list you have control over who gets added to the list. Also, you can set the rules for membership duration. You can use these lists in your campaigns audience groups. Using remarketing lists, your website visitors will be added to specific groups within seconds after visiting your site. The next time they surf online, they’ll see your ads. Each category defines a group of people that have taken a specific action on your website. For example, “homepage visitors” are people who have visited your website’s homepage and then left. “Category pages” refers to a people who have shown interest in a category of products but did not go ahead to search specific products. However, they advise not to create more than 10 lists, as this creates over-segmentation. 4. Tailor the message and bidding for each additional segment. In print, TV or outdoor billboards, advertisers show one message to everyone who sees the ad. But with online retargeting, you can show customized messages to each of your unique visitors. For example, let’s say someone visited your women’s summer dresses pages. You can showcase your whole collection of dresses by showing ads to this person. Use display responsive ads, that is ads that adapt to all device formats and sizes. 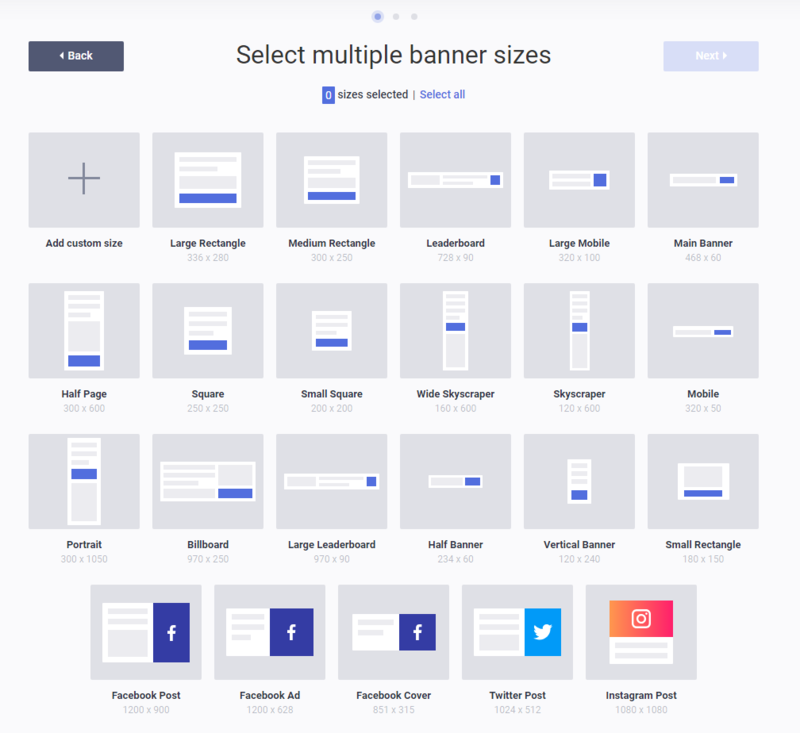 Create multiple size display ads in Bannersnack with Banner Generator. There are two types of remarketing ads. Read the descriptions below to know which one is suited for you. Static remarketing employs a limited number of ad formats. After you place these ads on your advertising platform, your ads will be served to past visitors according to your rules and to which pages they visited on your website. You can go for this type of retargeting if you’re a B2B company or if you own a small portfolio of services or products. By dynamic, we understand ads that automatically populate someone’s feed with product recommendations, based on their site activity. Unlike static ads, dynamic ads are unique to each individual. Dynamic retargeting is usually used by e-commerce websites with thousands of products and it has been proven to be most effective. Dynamic responsive ads run on native, text, and image inventories, and will automatically resize to fit any ad slot (including mobile-specific sizes), enabling maximum reach across all devices. When you create your ads, you provide the inputs (such as your logo, marketing image, description, and headlines) and let the system automatically customize the ad for you. 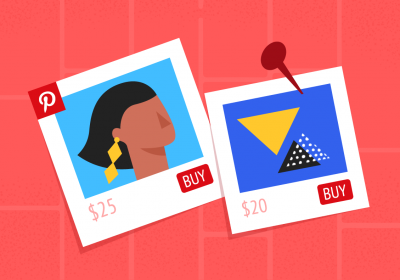 Create a product/service feed – You’ll have to create a feed that includes all of your products or services, along with details about each item (unique ID, price, image, and more). These details will then be pulled from your feed into your dynamic ads by Google Ads/Facebook or whatever retargeting platform you’re using. Add dynamic tag code to all your pages, so that visitors can be added to specific lists and associated with products IDs. Create responsive display ads in all formats (or at least 3), plus HTML5 for mobile devices. Choose language – choosing the language of your audience will ensure showing your ads to people in a specific country, speaking a certain language. Showing ads in English may not always be efficient, as people react better to ads in their native language. 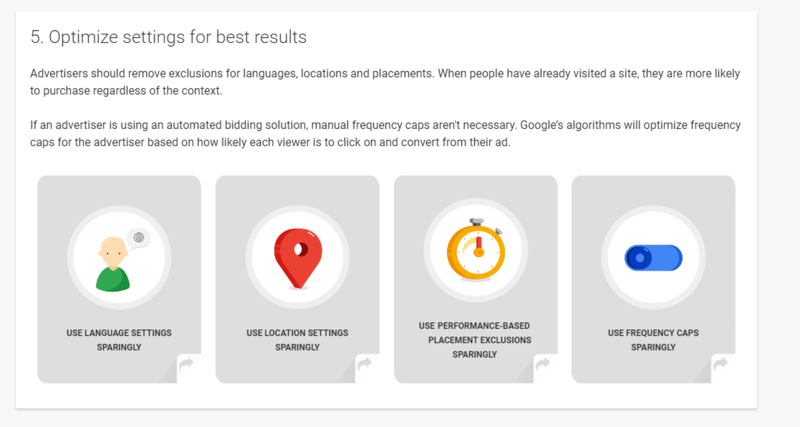 Select locations – Selecting specific countries is another way to make sure your ads will be shown to people speaking a precise language. Optimize demographics – Exclude age segments that are not relevant to your brand/product and ad. Or you can exclude gender categories, if you have a product addressing to a specific gender, like a clothing brand for either men/women. 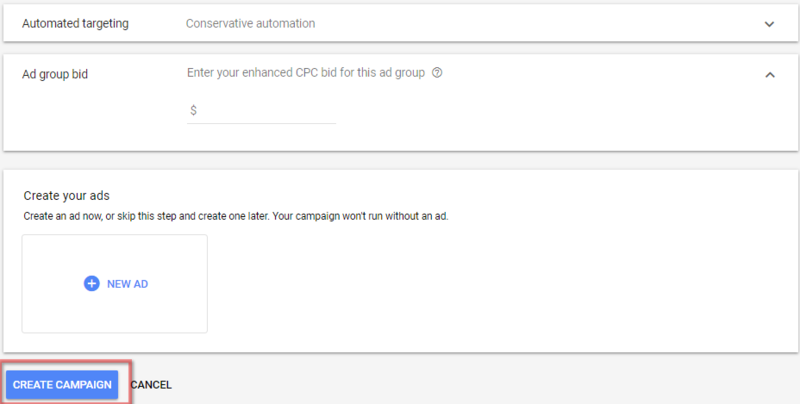 Limit frequency capping – Currently, Google Ads say that they manage and control how many times an ad will be shown to a person. However, it is good to know that you can adjust frequency capping manually, at any time. Placement exclusions – You can exclude certain sites and apps where you don’t want your ads to be shown. 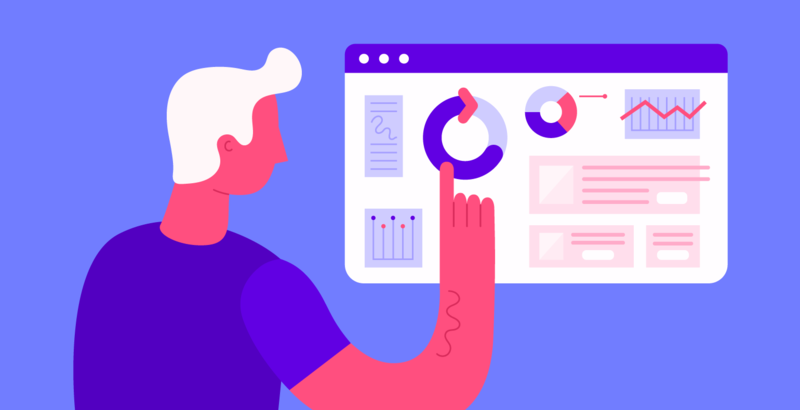 For example, after you analyze reports you conclude that certain websites or apps don’t deliver results or they’re not safe for your brand, you can exclude them. And you can go even deeper than that. For instance, you can exclude YouTube channels or YouTube videos. Devices (Bid adjustments) – You also have control over device placements. Certain brands/products don’t perform well on mobile. And it’s a well-known fact that tablets have low performance. So you can select the devices suited to your brand. Using retargeting you get to reconnect with people who have visited your website or app. Repeated interaction with your brand increases brand awareness. By showing people who visited your website the exact category of products(or products) they’re interested in, you increase chances to sell your products. Tailored messaging for different visitor segments increases click-through rates. When you reconnect with people who are already familiar with your brand or products, they’re more likely to click on your ad. Bidding more for a smaller, more targeted audience could mean saving loads of money. Remarketing is all about automated customized ads. By using dynamic, responsive ads, you will show the right products to the people who are interested in them. The Google Display Network reaches over 90% of internet users worldwide. So, there’s no doubt, Google Ads is the largest and safest advertising platform to work with. By safest, I mean you lower the risks of high costs, low click-through rates, and conversions. Standard remarketing: this type of remarketing lets you show ads to past visitors as they browse sites and apps on the Google Display Network. Dynamic remarketing: this is next-level remarketing, with ads that include products or services that people viewed on your website or app. 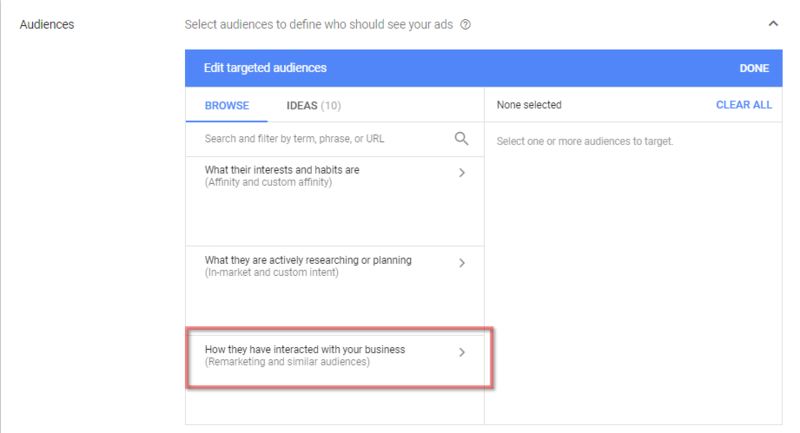 Remarketing lists for search ads: you can show ads to your past visitors as they do follow-up searches for what they need on Google, after leaving your website. 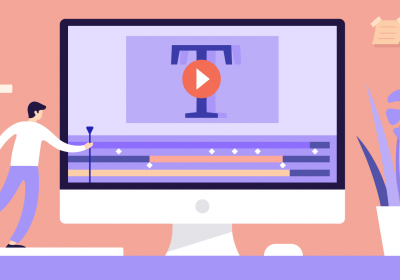 Video remarketing: you can show ads to people who have interacted with your videos or YouTube channel. Customer list remarketing: you can upload lists of contact information that your customers have given you. When those people are signed into Google, you can show them ads across different Google products. Sign in to Google Ads. 4. Hover mouse over “Create a campaign without a goal guidance” option to see all options and settings. 7. To create a Remarketing campaign go to Audiences and select “Remarketing and Similar Audiences”. 8. Choose your audience lists. 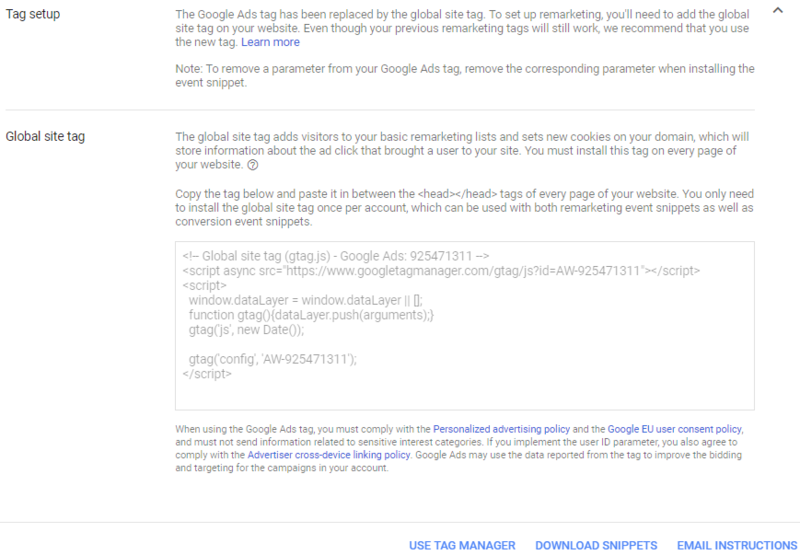 Google Ads will create the remarketing tag for you. You’ll be able to email the website remarketing tag or mobile app tag ID to yourself (or to your webmaster), and instructions on how to add it to your website or app. In case you’re creating the remarketing campaign through Google Analytics, you’ll see a checkbox to use the tracking code that’s already on your website instead. Google will create an “All visitors” list. You don’t need to create this list yourself. The “All visitors” list includes everyone who has visited tagged pages on your website. If you want, you can create new lists for specific groups later. AdRoll is another great advertising platform for retargeting campaigns. It offers wide Internet coverage and a user-friendly interface. Segmentation of audience is easy with AdRoll. Thanks to their partner platforms – Facebook, Yahoo, Google, and Microsoft – AdRoll allows you to reach 98% of the people online. Or at least, this is what they promise. 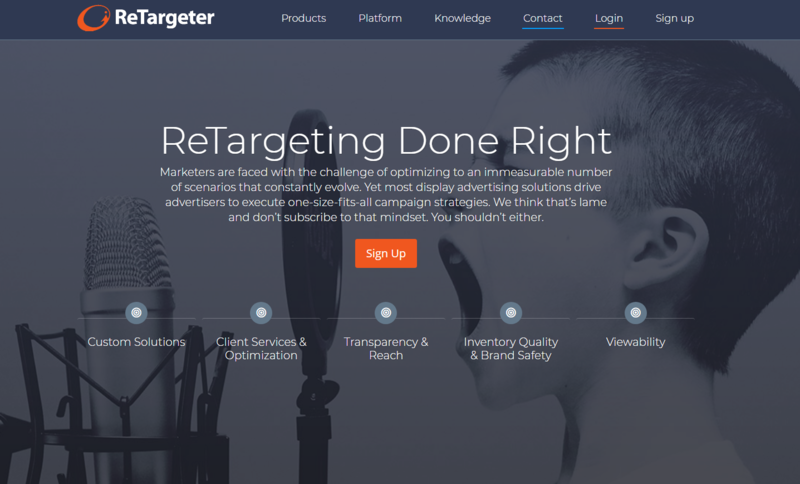 ReTargeter is also an advertising platform worth considering for retargeting. They offer retargeting services such as: site retargeting, Facebook Exchange, CRM Retargeting, email retargeting, and search retargeting. The platform works only with websites with more than 30,000 unique visitors per month, so you’ll get exposure to huge traffic. You can custom settings as you want, including demographics, locations, user income or intent. You can the whole retargeting tools palette (listed above). They don’t have inventory restrictions based on spending level. You have full network access. 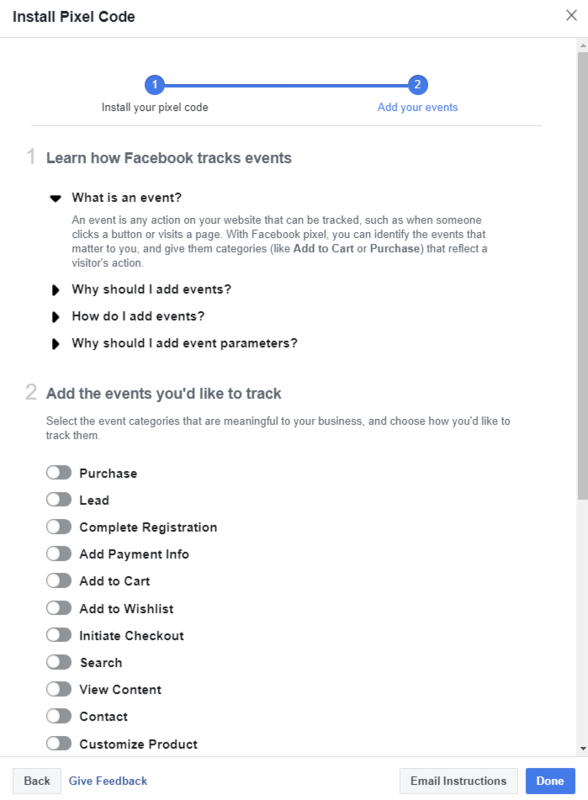 Facebook provides two types of retargeting: pixel-based and lists retargeting. Pixel retargeting enables immediate action. Next time they access Facebook, even a few seconds after they have left the website, ads are shown. List based retargeting means that you need to have a ready-made contacts list and just upload it to Facebook. The platform will immediately identify the contacts’ email addresses, associate them to Facebook users, and serve ads to them. 2.B. 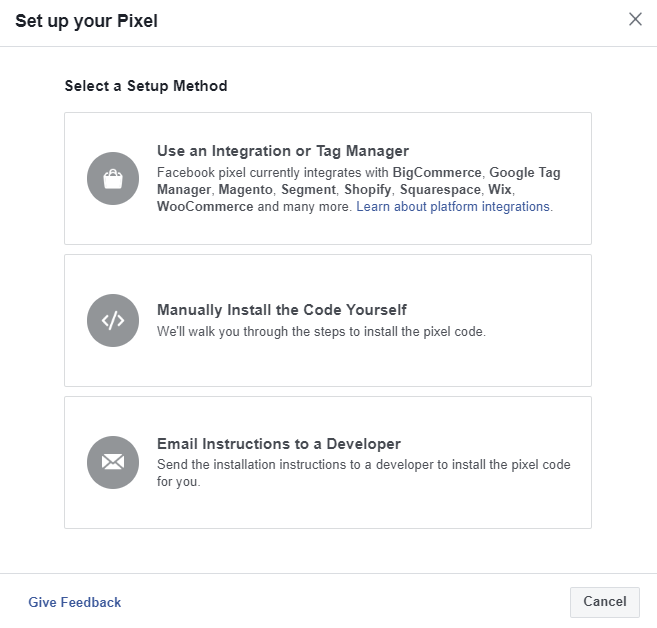 Install the Facebook pixel to every page of your website, so that the platform can collect data about your visitors and can build visitors lists. 2. Choose your campaign Objective. 3. Go to Audiences to select the remarketing lists you want to use. 4. Optimize settings: location, age, interests. You can segment lists prior to settings, by going to the main Audiences setting and creating specific segments of audience. There are a few specs: images should be 1200 x 628, do not include more than 20% text in images, do not add a play button on a static image. 7. Monitor your campaign’s progress. AdRoll is an official Facebook partner so you can set up retargeting Facebook campaigns through them too. Learn how. Twitter Ads also offer remarketing services. If you find that your target audience uses Twitter, you can run remarketing campaigns also on this platform. To reach professionals, use LinkedIn’s retargeting program. What does the future have in store for retargeting? With Artificial Intelligence on the rise, the future is brighter than ever for retargeting. Machine Learning can help increase conversion rates by providing narrower audience segments, identifying the best placement contexts for ads and by predicting the potential performance of an ad. Considering consumers behavior change every year, AI can identify fast-changing behaviors and offer recommendations. With AI, marketers can use valuable insights from consumers behavior patterns and adapt their strategy accordingly. All in all, if you want to run highly effective online campaigns, you need to switch to retargeting. 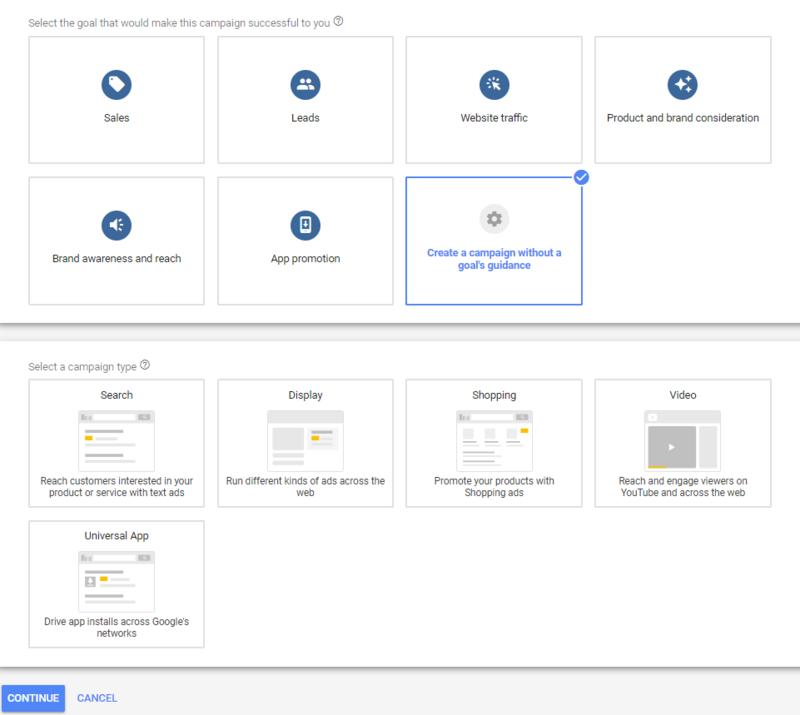 Go again through this article (if necessary), write down the steps and start setting up your campaign in one of the advertising platforms that offer remarketing as an option. This is a great read. It’s nice that you have shared this one. Retargeting is vital nowadays, this is must to understand and apply nowadays to maximize sales potential. Yes, I agree, retargeting has become the norm, so we must keep up and understand how it works!